When I first had the inspiration to make this recipe, I didn’t realize it would be something I’d make over and over again, have it in the freezer or ready to go in the refrigerator so I can use it at a moments notice when Mexican food cravings strike – they never go away – who am I kidding?! It has become a non negotiable refrigerator staple, like mustard, mayo, eggs and cashew milk. 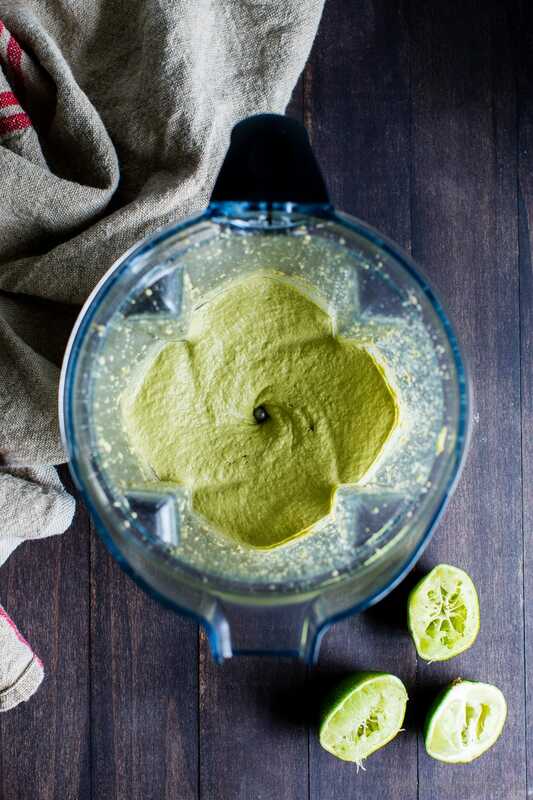 I first shared Chili-Lime Pepita Crema with a taco recipe a few years back that has become a blog favorite, but I wanted to give this condiment its own space, title and page. I’ve found it to be a tasty, dairy-free replacement (most of the time) for my love of sour cream in Mexican food. I love it so much (I know, very corny), that I created this post specifically for it. I hope you enjoy it as much as I do and dip, dollop and spread it on all things Mexican food. Enjoy it simply too with tortilla chips. It’s quick to whip up and so versatile! You’ll need a high speed blender (I use VitaMix) to whip this up for a silky smooth texture. I’ve attempted making Chili-Lime Pepita Crema in the food processor and while the flavor is good, the texture is off. Adjust the spicy to taste. I find that six pickled jalapeño rings create a spicy yet tolerable heat level. If you prefer, adjust to taste. Sub one chipotle pepper in adobo sauce for the pickled jalapeño rings for a smoky/spicy flavor. The vibrant green color will be lost, but the flavor is fantastic! This condiment is versatile. 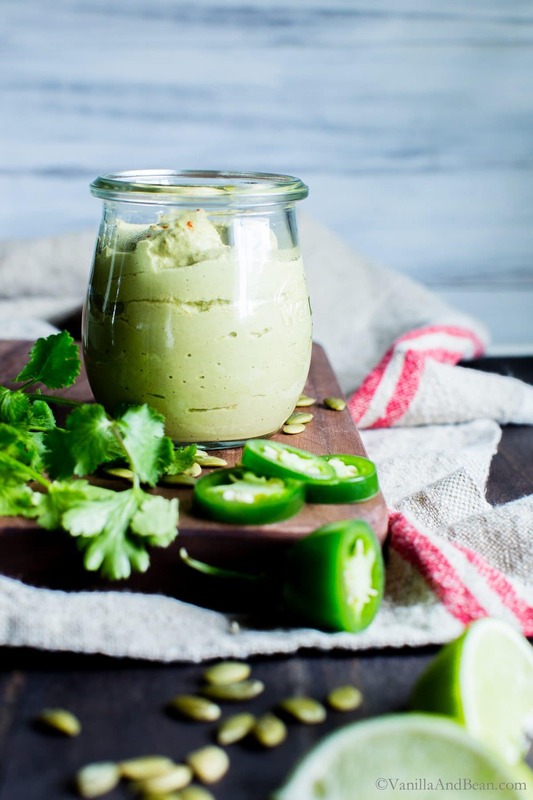 Use it as a dip, dollop or spread as a side for all your Mexican food recipes. A little bit goes a long way! 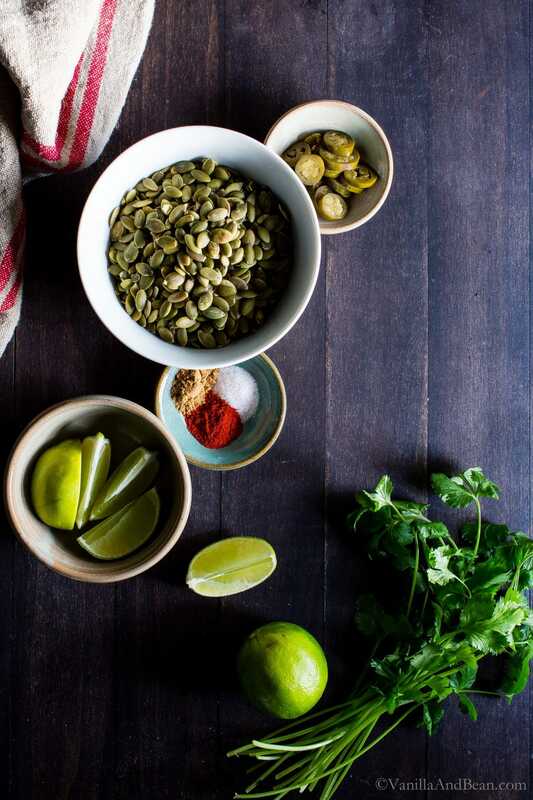 Dollop or spread Chili-Lime Pepita Crema on Cauliflower Tacos, Black Bean Enchiladas, burrito or burrito bowls… or share as a dip with tortilla chips. Anything Mexican food related where you need a bit of creamy. spicy. limey! 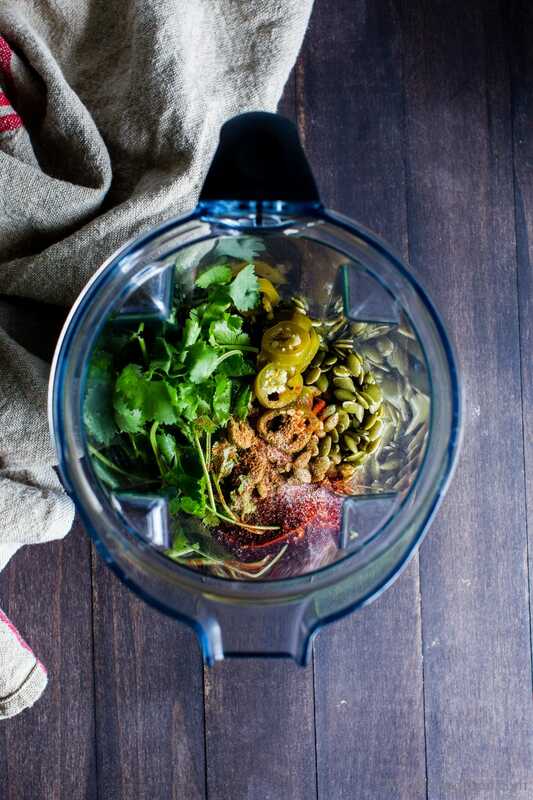 Place the pepitas, lime juice, jalapeños, cumin, paprika, sea salt, cilantro and water into a high speed blender (I use VitaMix) and blend on the puree cycle or medium high, scraping the container down several times to create a smooth puree. Place in a bowl for serving or storage container. Store in the refrigerator for up to five days or freeze for up to a month. If freezing, thaw in the refrigerator overnight and whisk or reblend to create a smooth texture. Please pass me the chips.. I’m ready to dive in to this delicious crema! I’m SO with you Laura! So dang excited about this crema! Dairy-free, too! Haha, you are so right, those cravings never go away. I already know this will be a staple at our house! So glad you decided to share this one separately Traci! 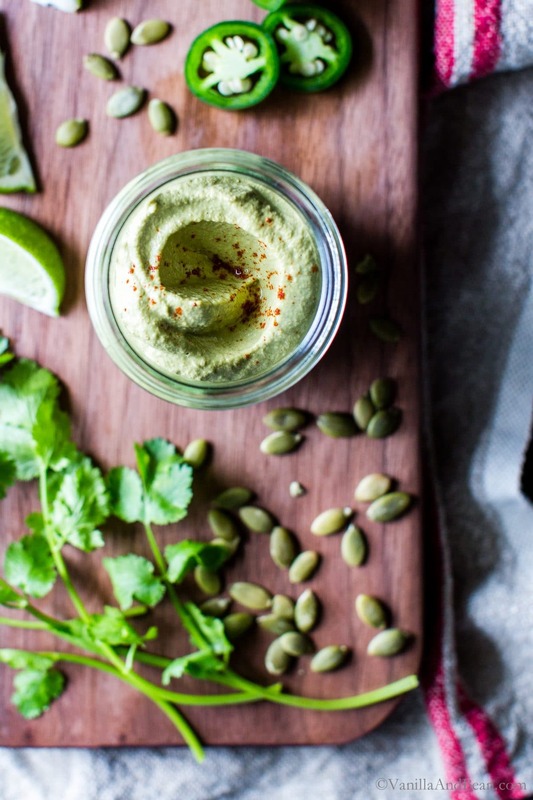 Perfect with tortilla chips or fresh veggies! 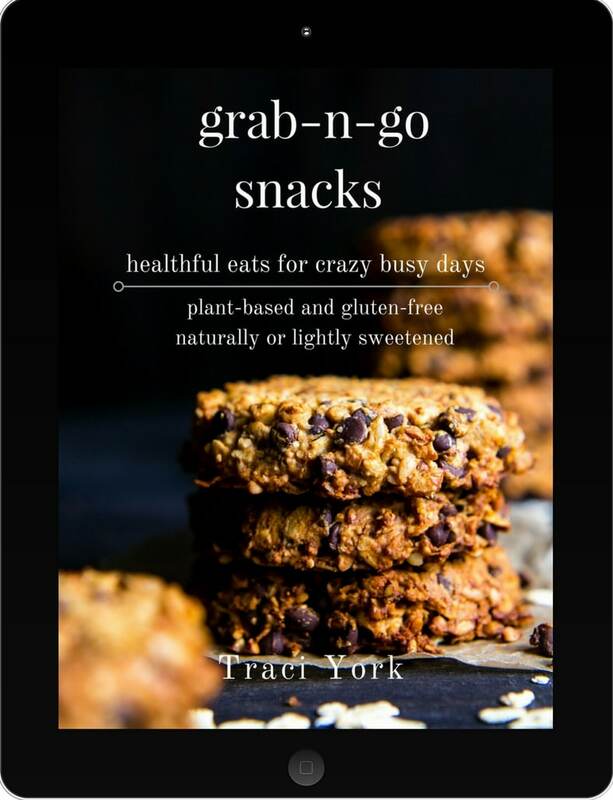 OMGeee – love this with tortilla chips! I am all over this! I have also just discovered Shishito peppers that I simply roast in a pan and serve with Katzen’s Summer sauce…but now I am gonna try your creation with them. What’s not to love? Thank you! Shishito would be fabulous in this! Roasted no less! I’ve also roasted jalapeños and plopped them in this… need to add a note! I hope you enjoy it! This looks delicious, Traci – I love the pretty green color and the spicy heat from the jalapeños. Are pepitas easy to find in the market? I haven’t seen them but I haven’t really been on the look out for them either. I like Liz’s idea of adding it to toast! Have a great weekend! Hey Geraldine! I buy pepitas from bulk bins. I have seen them pre-packaged, but it’s rare. I’m going to try Liz’s idea! Total mouthwater! lol! This looks luscious! Definitely deserving of it’s own space on the blog. I want to slather this on my daily avocado toast! Oh hey now… that sounds dreamy! Must try!